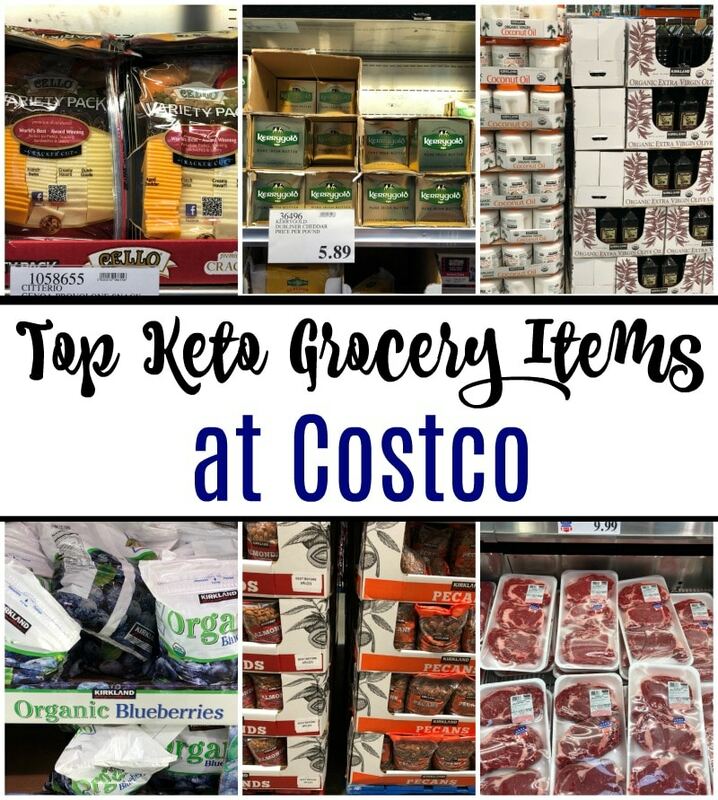 Top Keto Grocery Items at Costco - This is so helpful! 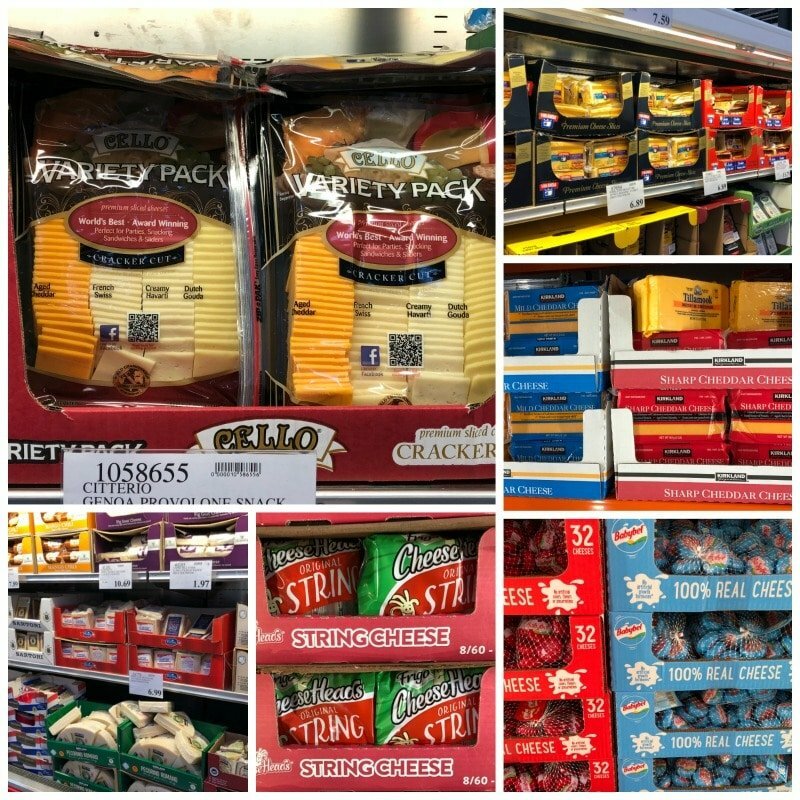 Since I posted my Very Basic Keto Grocery List, Top Keto Grocery Items at Walmart, and Amazon Keto List, I thought that perhaps a list of top Keto grocery items at Costco might be helpful. 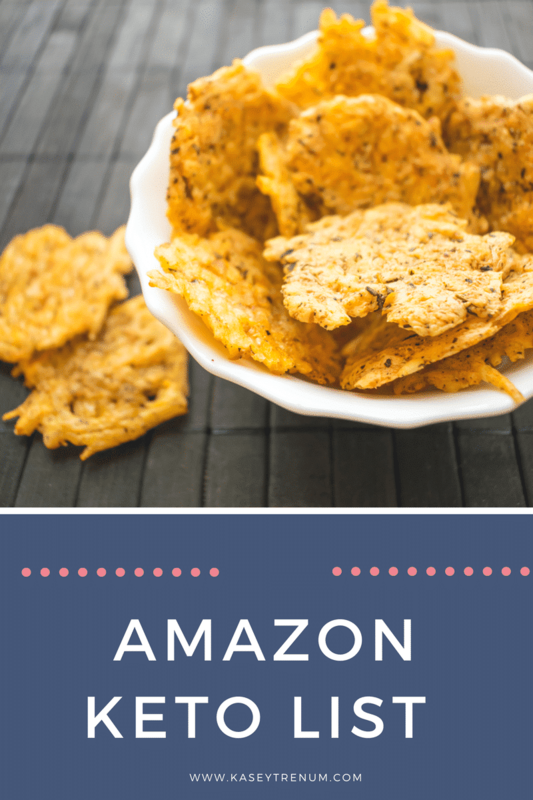 (My friend, Lauren posted an ALDI and Target grocery list you should check out too.) 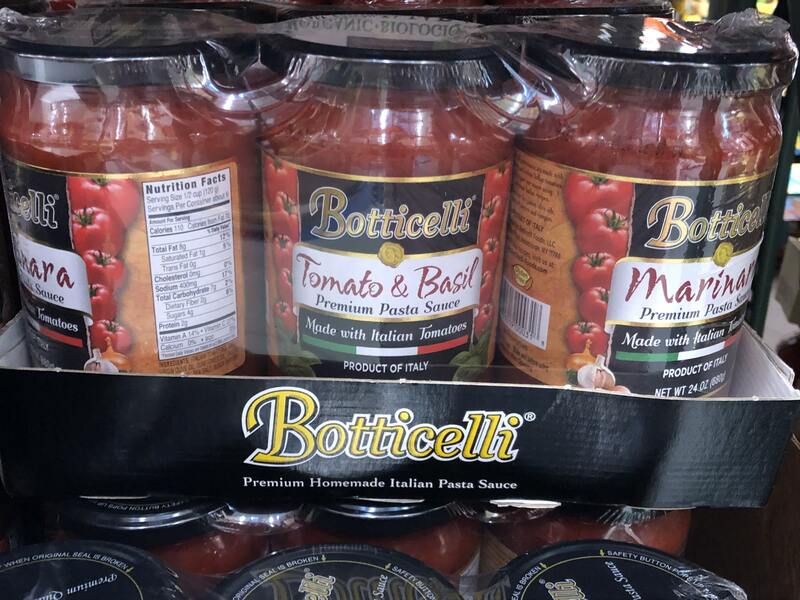 While we were in Ohio visiting my hubby’s family, we took pics of some of our favorite Keto grocery items at Costco. Of course, the inventory can vary from store to store, but I wanted to post a simple list to get you started. 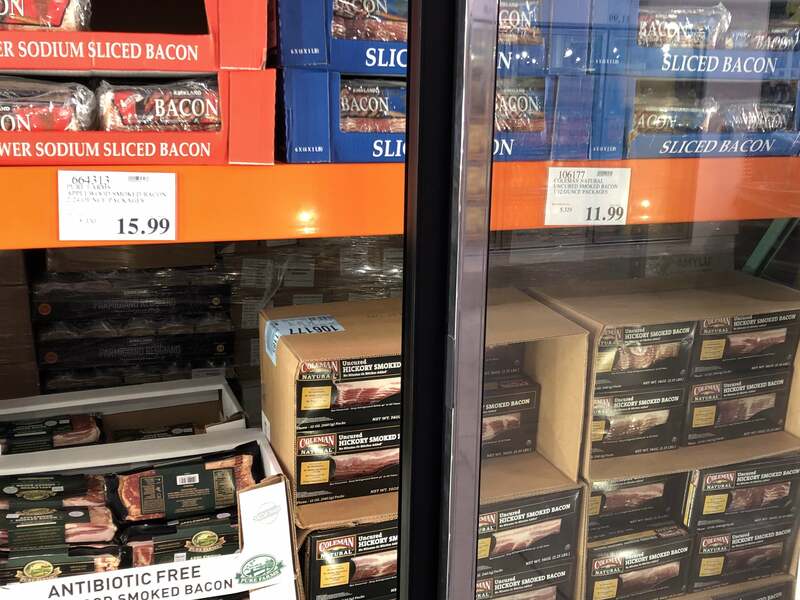 Typically, we like to make a Costco run every other month or so to stock up on our favorite keto staples, then each week we fill in the gaps at our local grocery store. 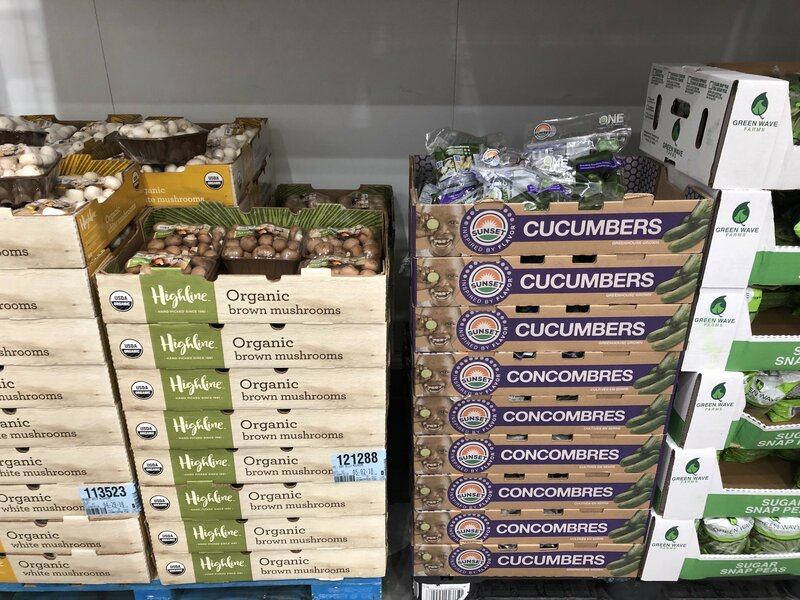 I love all of the different organic food offerings available at Costco as we are trying to be purposeful to buy organic when we can. 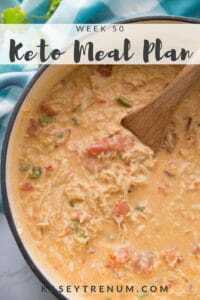 There are tons of other keto items, but I narrowed it down to the most popular ones. 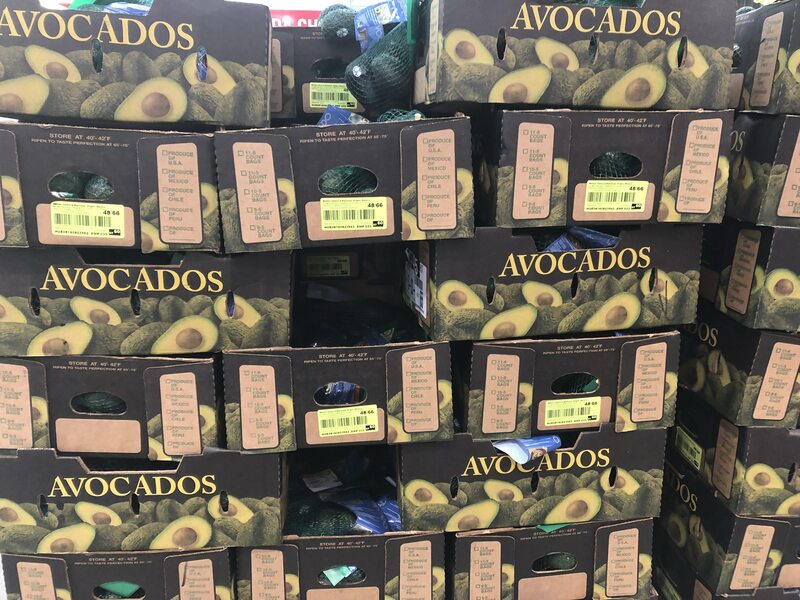 Avocados are an incredibly healthy fat and can be eaten many different ways. I so wish that I liked them. It is amazing how sweet fruit tastes when you quit eating sugar. 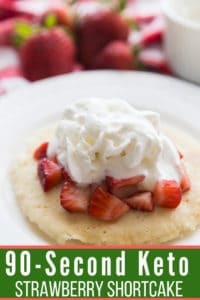 Although I eat berries in moderation, I do love to make Lemon Berry Fluff, Mixed Berry Muffins, Blueberry Bread, and 90-Second Strawberry Shortcake. I especially love berries in the summer. 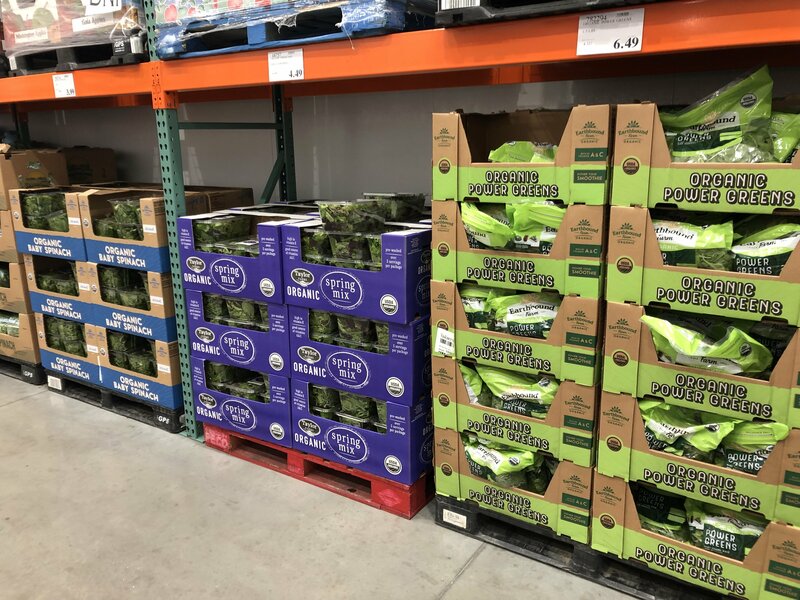 Costco offers a wide variety of organic salad mixes at competitive prices. I have found the quality of the asparagus to be far superior to my local grocery store. They also carry fresh riced cauliflower. If you have been around for any length of time, then you know I cook with mushrooms from time to time because they give foods fantastic flavor, but I still hate them and pick out every single one. Chicken & Mushroom Gravy and Chicken Lombardy are two of our favorite recipes that include mushrooms. Green beans, celery, and brussels sprouts all make fantastic sides. Many use celery instead of chips to scoop keto approved dips. We love to grill out in the summer and make Brussels Sprouts & Bacon as our veggie or I often saute fresh green beans in butter and add a little bacon and parmesan cheese. There are tons of beef options. One of our favorite meals is Keto Pot Roast (Crock-Pot recipe here / IP recipe here). 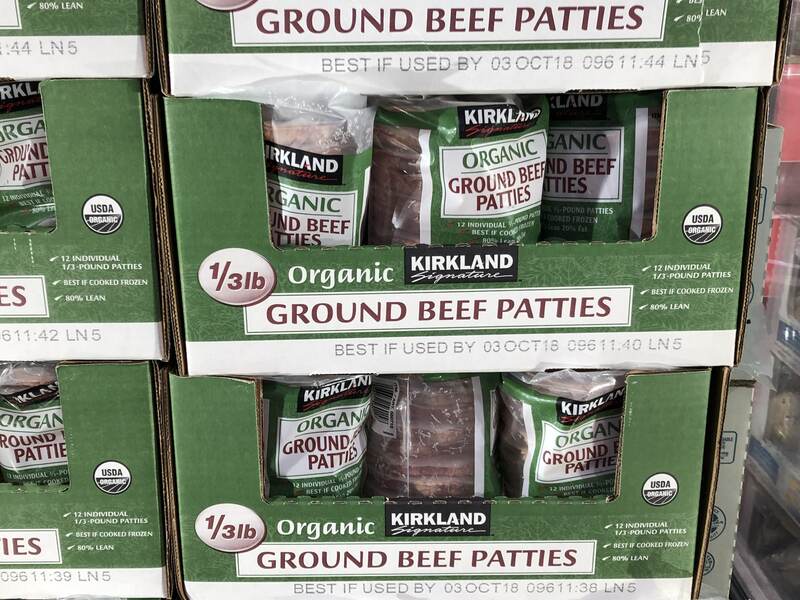 Also, we buy several pounds of ground beef and brown it all at once. Then, I divide it by the pound into zip lock bags and freeze it. This makes dinner so easy. I can have tacos or Mexican Cheesy Skillet on the table in a snap. 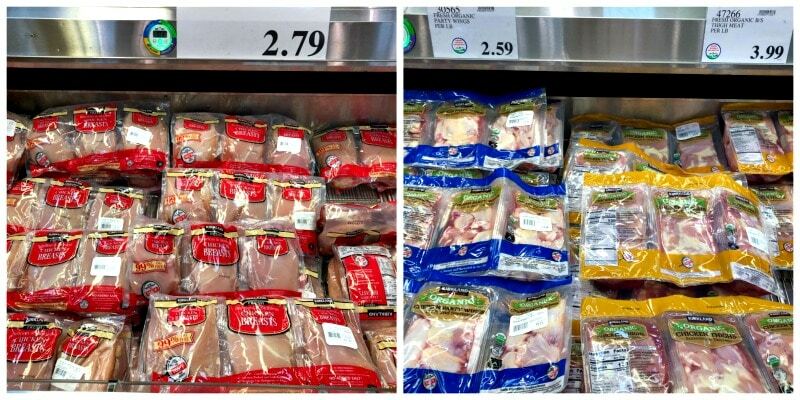 There is also a great selection to purchase chicken in bulk in either wings, chicken breasts, or thighs. 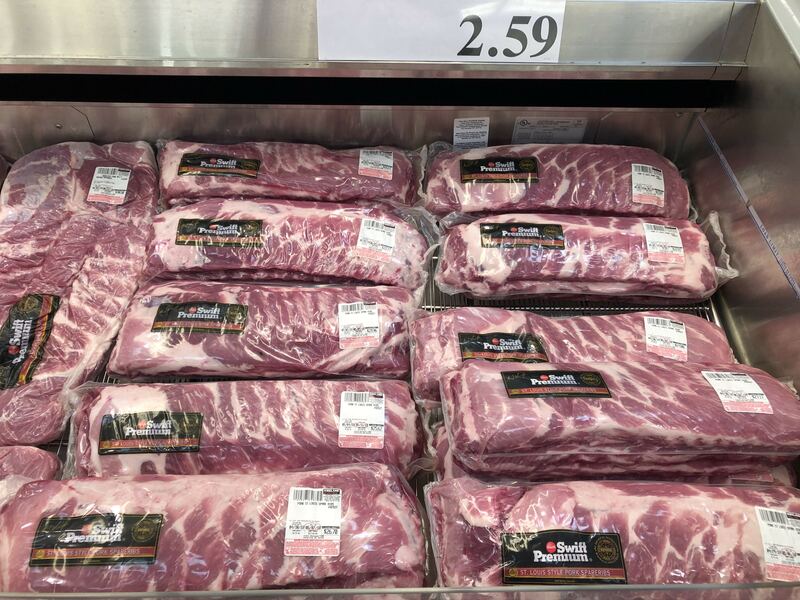 It’s grilling season, and we can’t wait to start using our grill and smoker this summer. My hubby was super excited about these ribs. 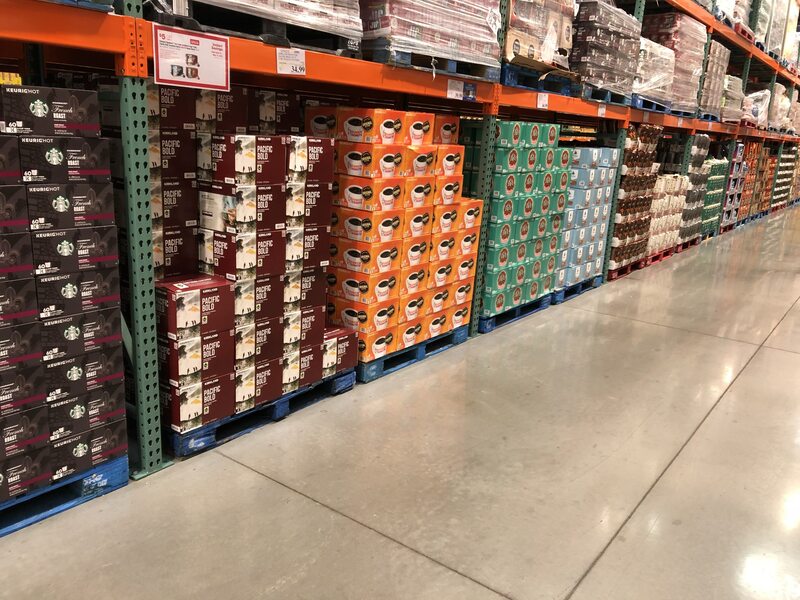 Costco has a fabulous selection of cheese. I love the cheese slices in the top left picture. I use those to make my Keto Cheese crackers, but we also keep string cheese and block cheese on hand all the time. 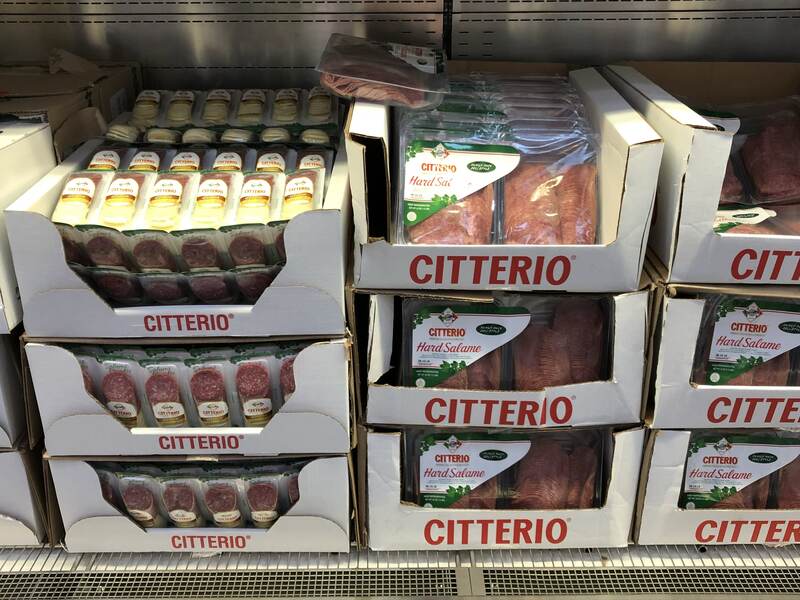 We found these great snack packs of salami and salami and cheese. 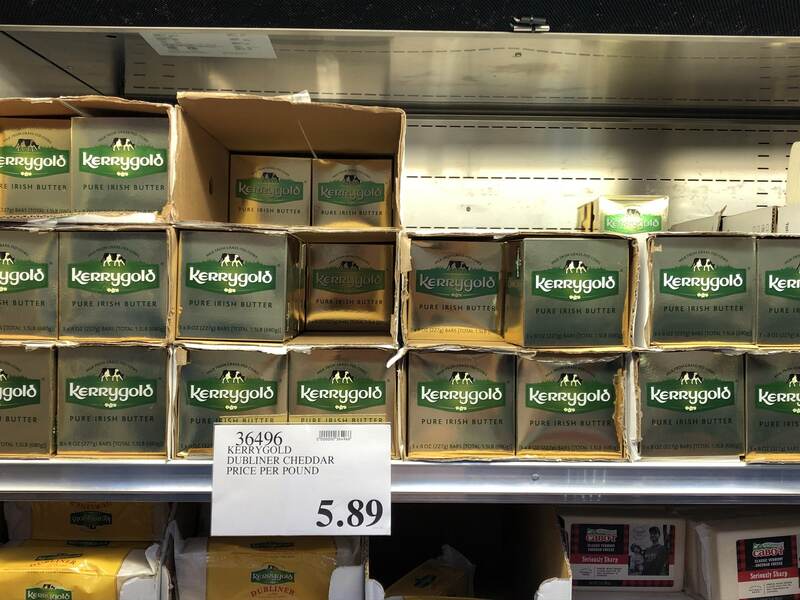 We can’t forget Kerrygold. It is the gold standard for grass-fed pure Irish butter. They also carry Kerrygold cheese. These water bottles are my favorite water. For some reason, these little 8 oz water bottles are less daunting to me than the larger ones. I open a new one in the morning and refill it all day to meet my water goals. I don’t know why this works so well, but it does. 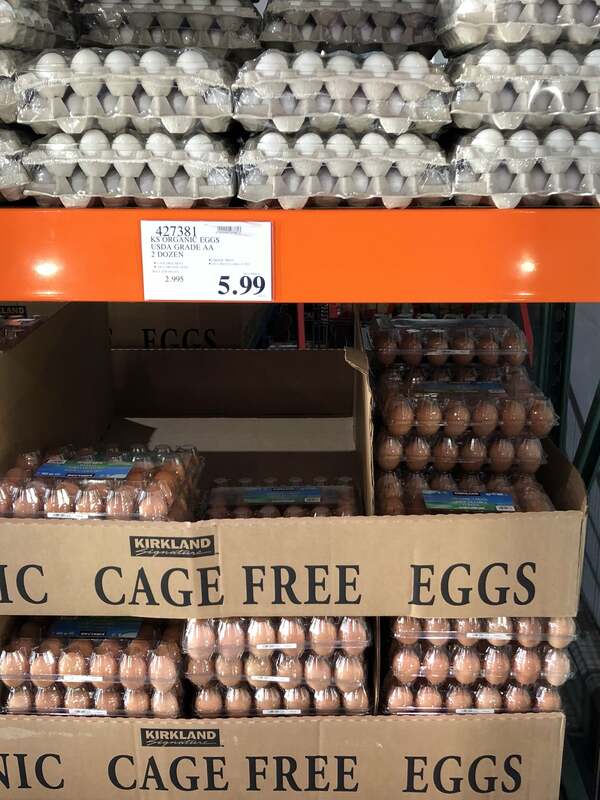 If you go through eggs at your house as we do at ours, buying eggs is bulk is a good idea. 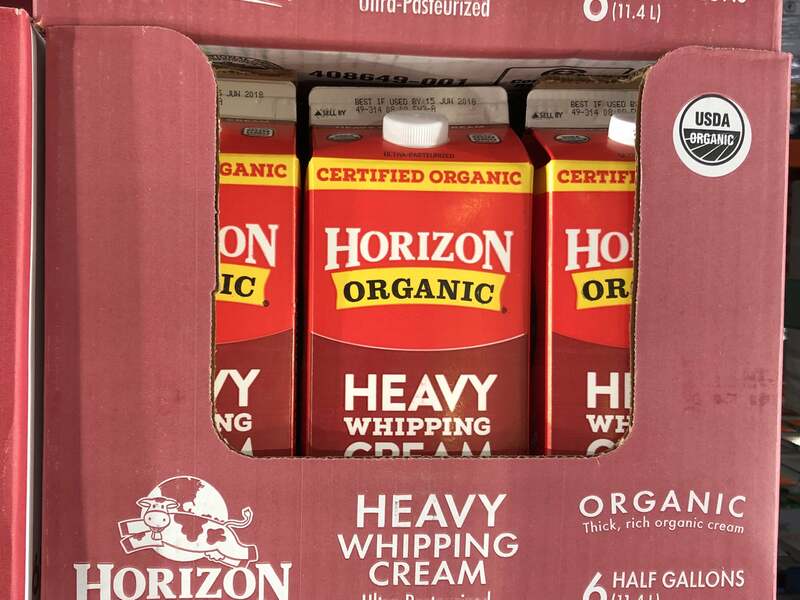 Heavy whipping cream is a staple at our house. I use it in so many recipes and my coffee every morning. 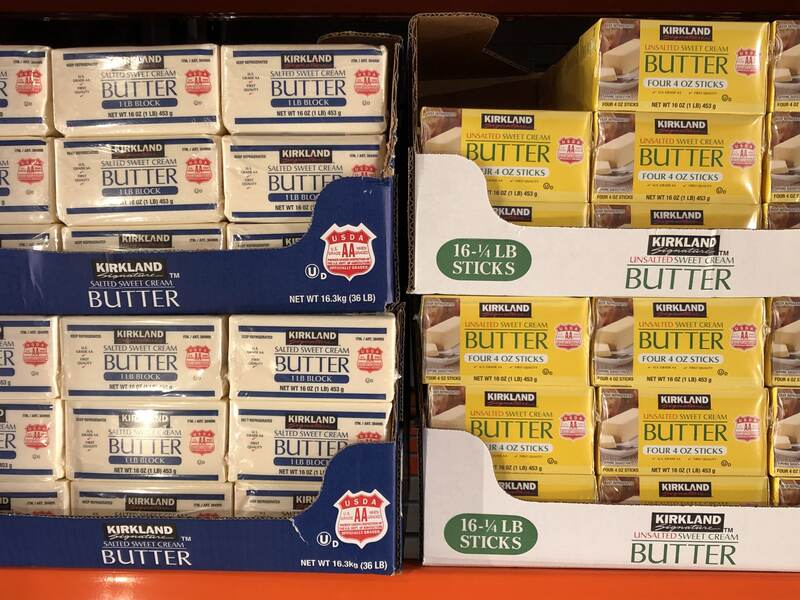 If you haven’t taken the plunge with grass-fed butter, Costco still has you covered. I stock my fridge with both. 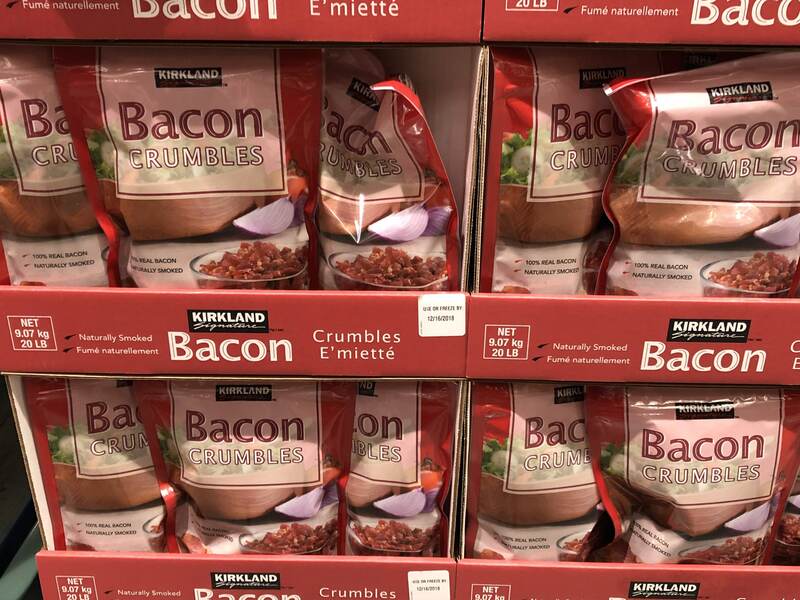 Is it even possible to have too much bacon? I think not. Thankfully, there are several different options. Since berries aren’t always in season where we live sometimes, frozen is a great option. 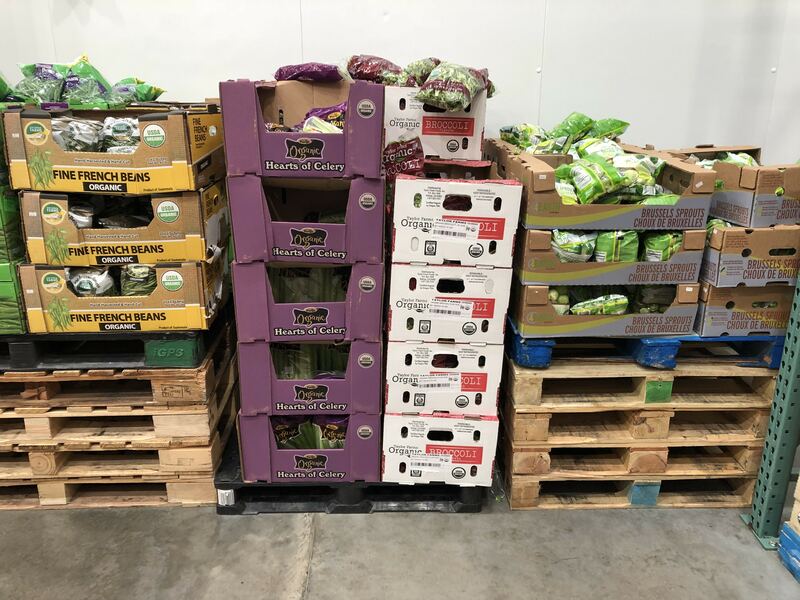 Although I prefer fresh produce, it is easier to use frozen since it is already precut and washed. 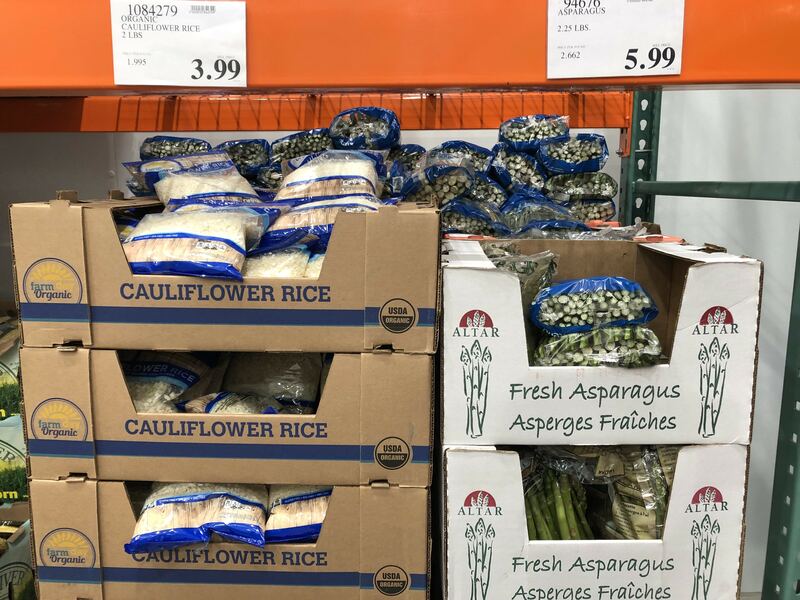 Our local Costco carries a big bag of riced cauliflower too but I didn’t see it in this particular Costco when we were visiting Ohio. 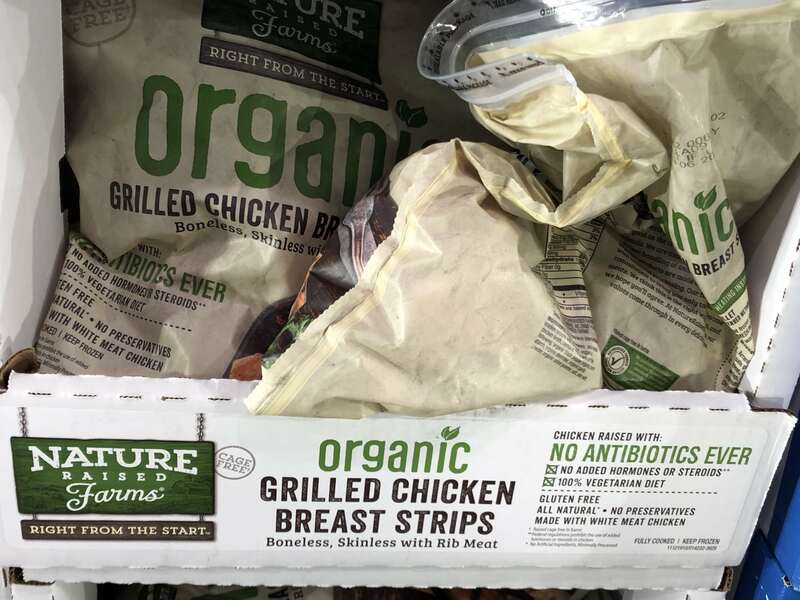 I keep these organic grilled chicken breast strips in the freezer for a quick meal in a pinch. I can make a salad or melt butter and cheese on top and add a veggie. Bunless burgers are such an easy meal idea. 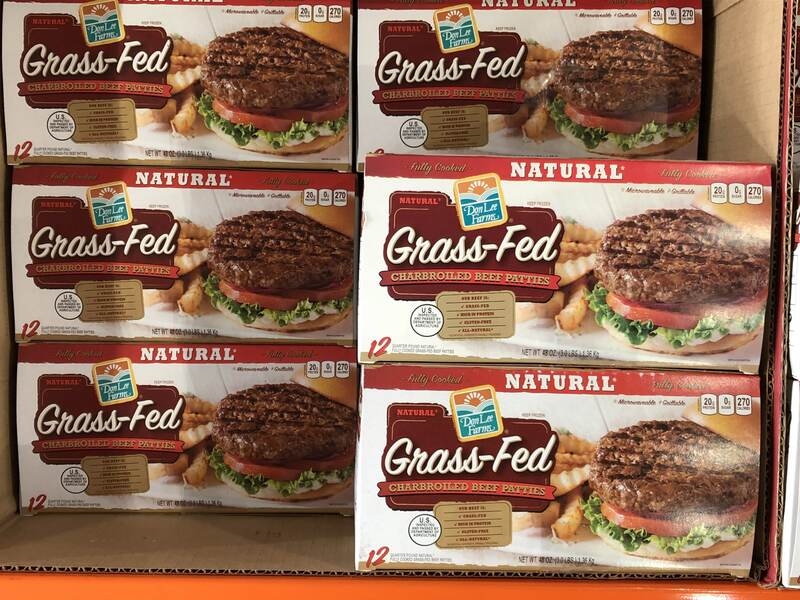 If you prefer grass-fed then you have that option too. 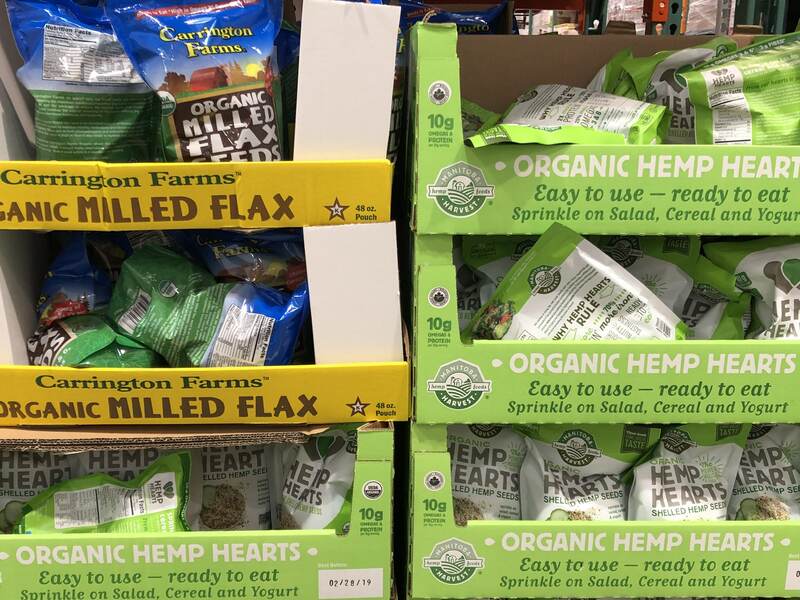 I haven’t used milled flax or hemp hearts but have seen them used in many recipes. 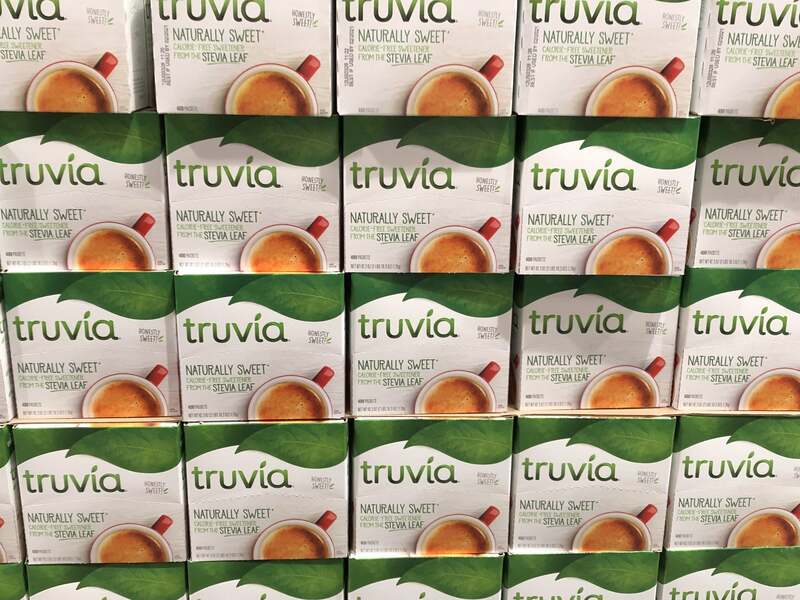 Truvia is fantastic in coffee. This is a big box of the packets. I used these for the first time at my in-laws this weekend and liked it a lot. 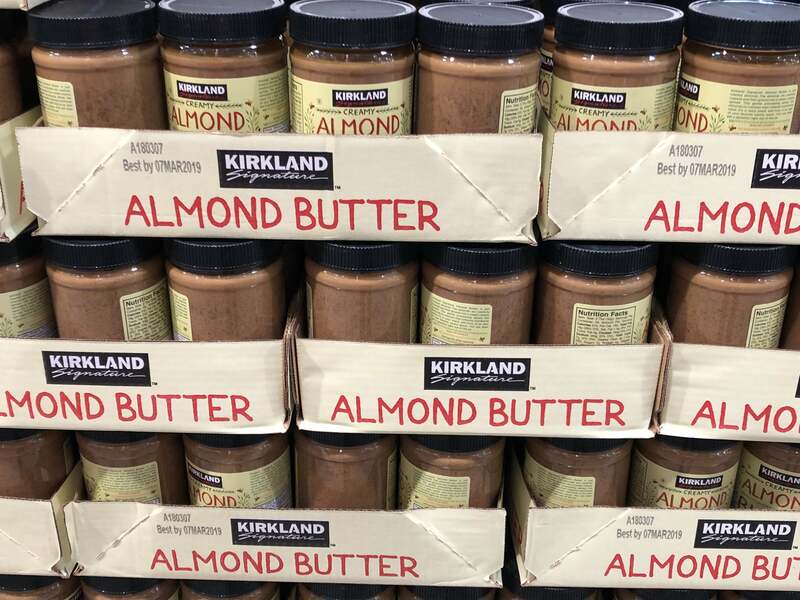 I know many people use almond butter. I made sure to check the ingredients, and this one doesn’t contain any added sugar. If you love peanut butter and are looking for one that doesn’t contain added sugars check this one out. 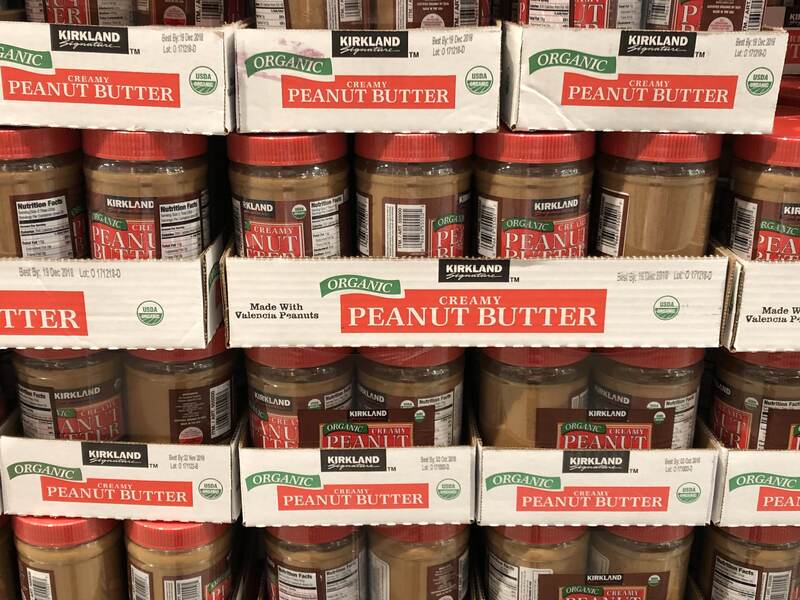 I wish we enjoyed creamy peanut butter, but we are crunchy peanut butter lovers all the way. There are many options for coffee that include both k-cups and bagged coffee. 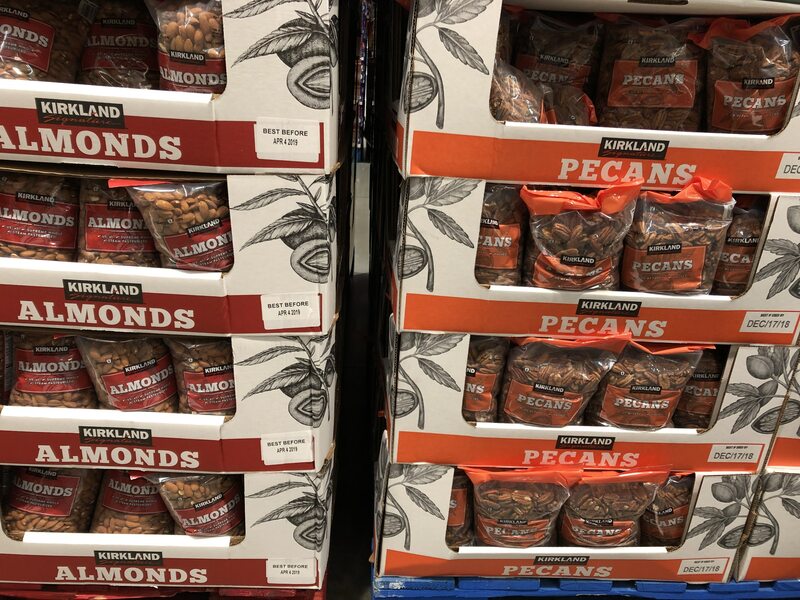 I love pecans so much! 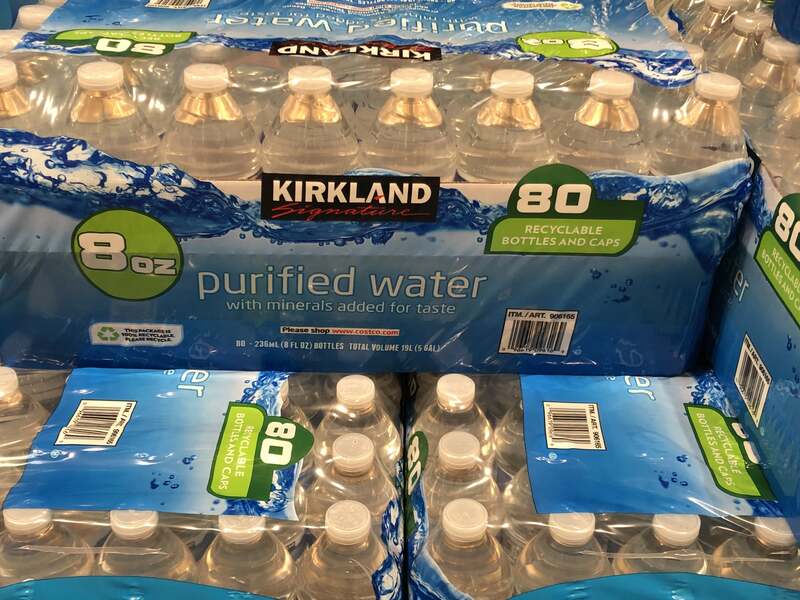 We stock up each time we go to Costco. They also have a fantastic bag of almonds. One of my favorite recipes that use pecans is lemon pie with a pecan crust. 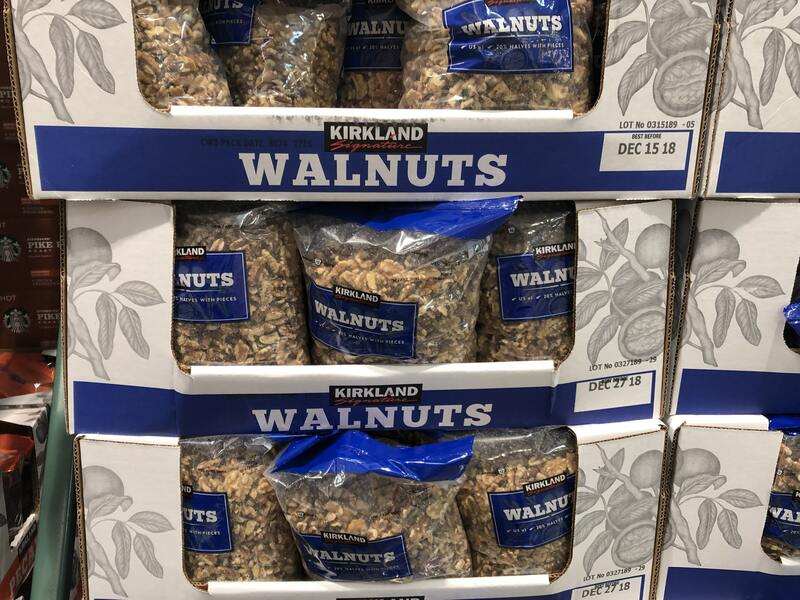 We also buy a big bag of walnuts. 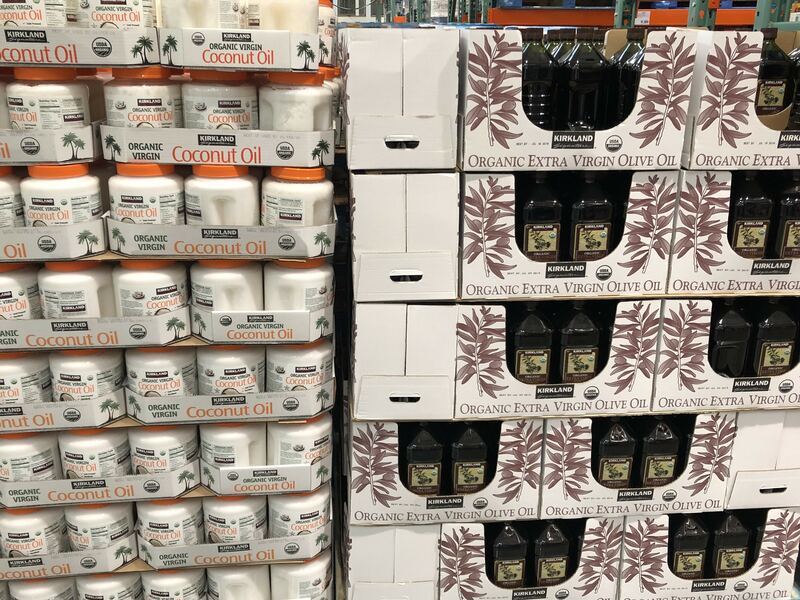 Both the coconut oil and olive oil are organic and great options. I add this coconut oil to my coffee and use it to make Everything But the Kitchen Sink Fat Bombs. Most people use pink Himalayan salt while following a ketogenic diet. This one will last forever! We bought it last year when we first started keto and still have over half of it left. 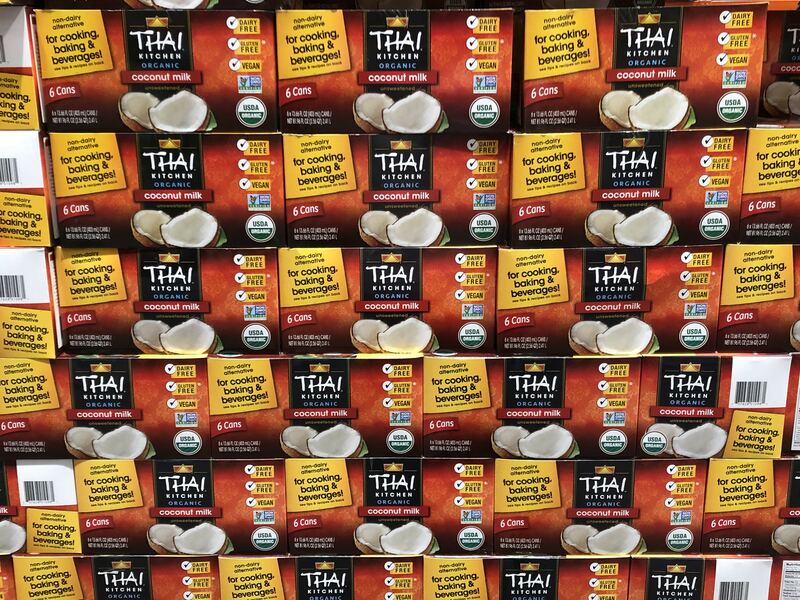 I know a lot of people who are dairy free use coconut milk. 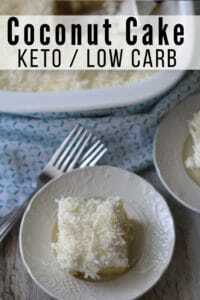 I’ve also seen several keto sweet treats with coconut milk as an ingredient. I always keep a can or two in my pantry. 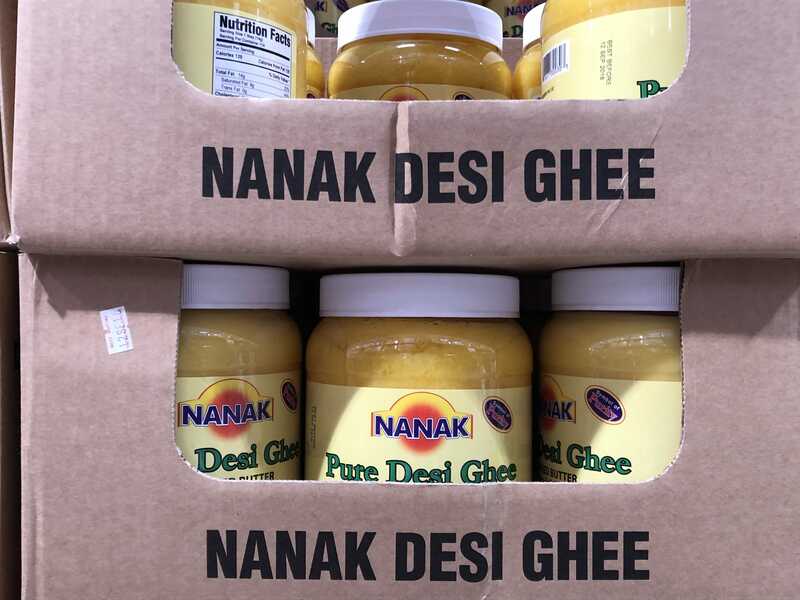 If you use Ghee, you are in luck. I almost missed this, but my hubby pointed it out. (He’s getting better and better at spotting keto grocery items.) If you had rather make Ghee homemade, my friend, Lauren, has an easy recipe here. 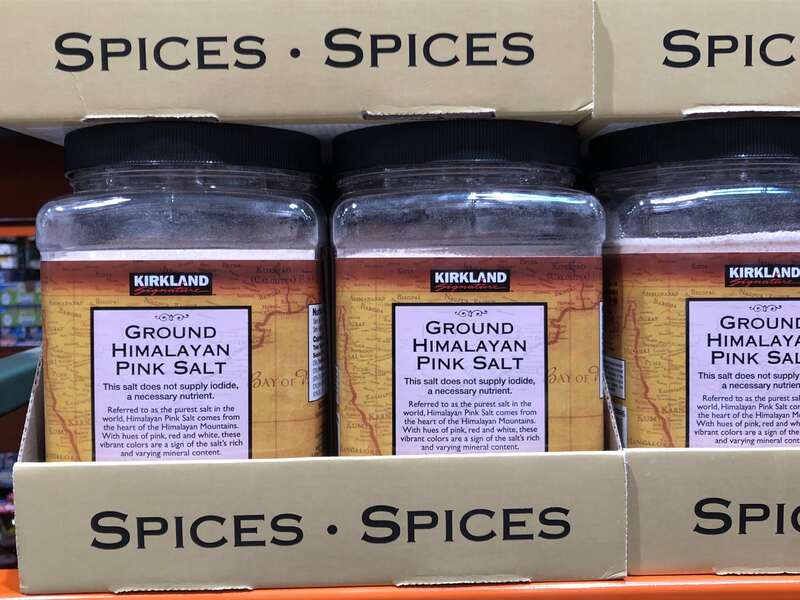 Spices make everything better. 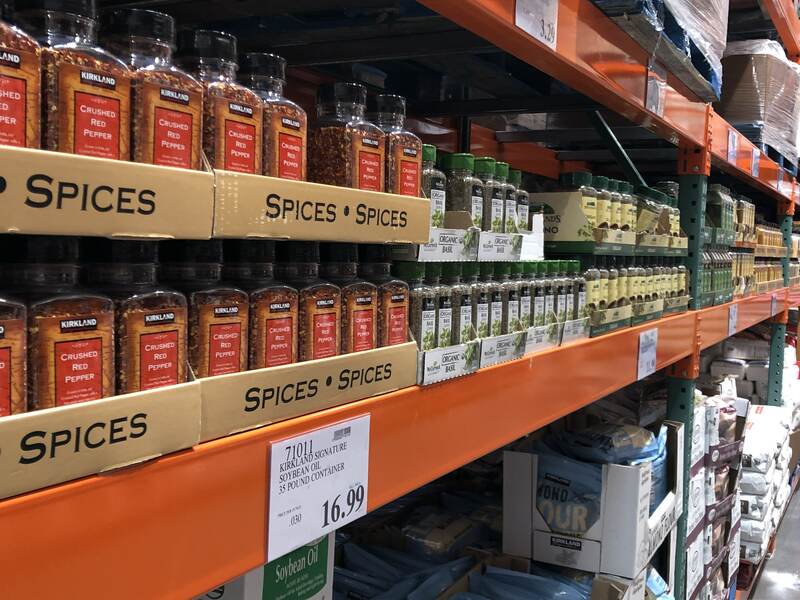 Costco offers a wide variety. 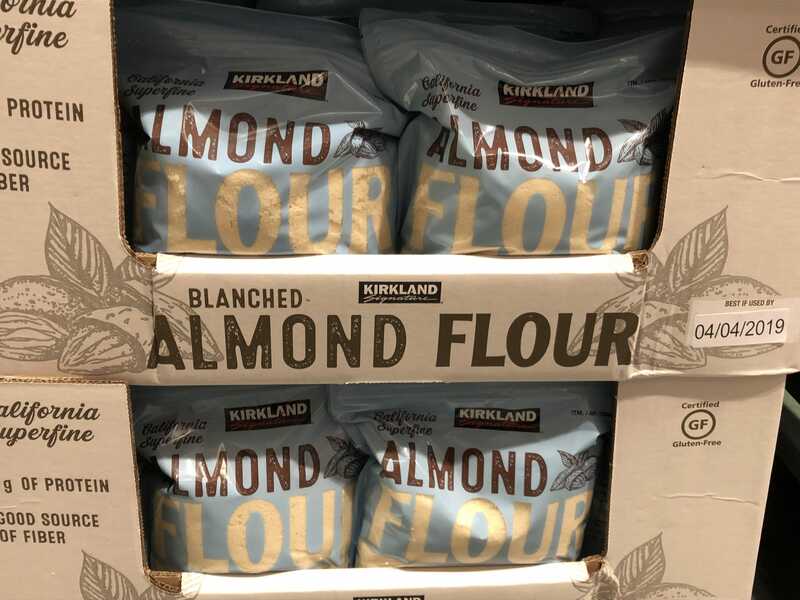 I have yet to use almond flour since my oldest daughter is allergic to almonds, but Costco stocks this huge bag. You can make these delicious Keto bagels with almond flour. 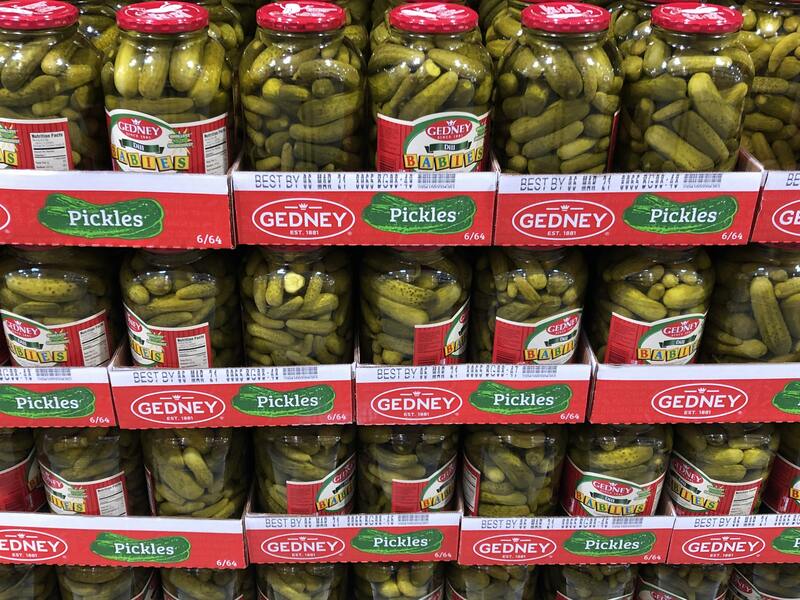 Pickles are a yummy snack and they add sodium, which is helpful if your electrolytes need balancing. This bag of bacon comes in so handy for many recipes that call for crumbled bacon like Cheesy Ranch Chicken & Broccoli and as a topping for Broccoli & Cheese Soup. We don’t eat olives, but I know a lot of people do. 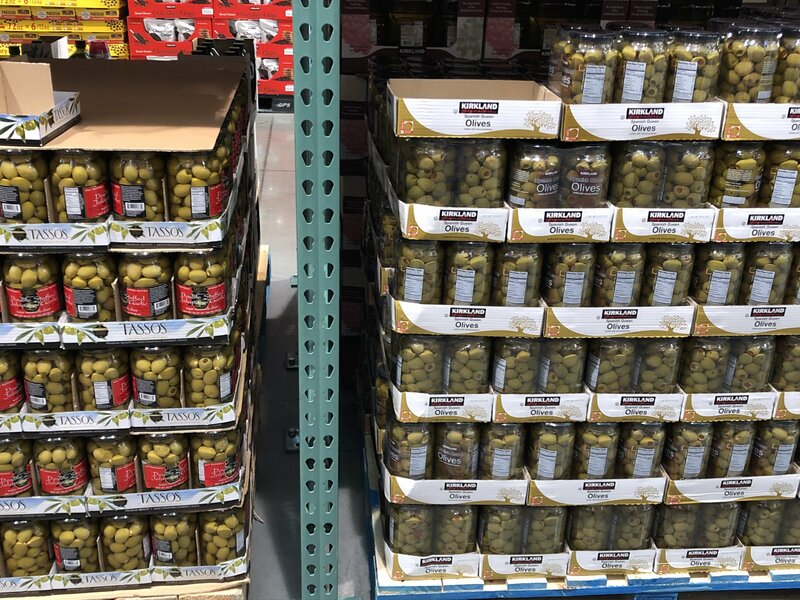 We found regular olives and jalapeno olives. 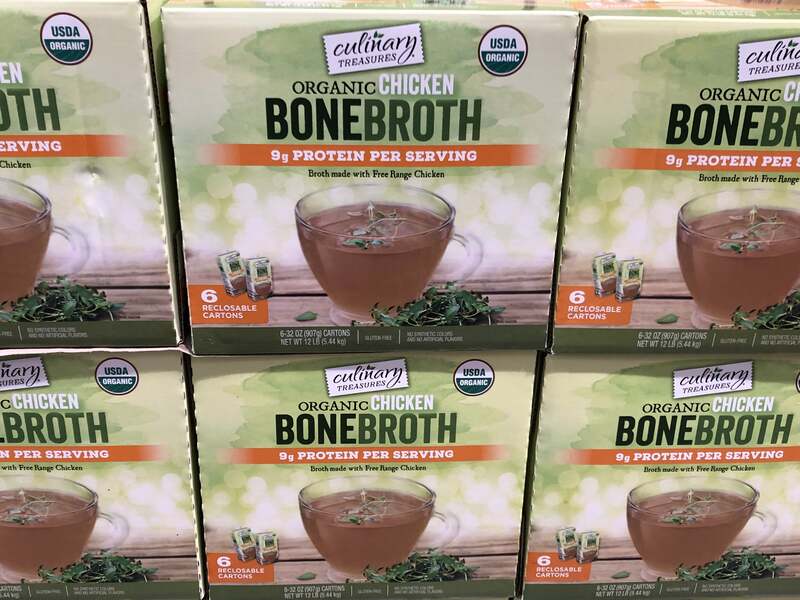 We found both chicken and beef bone broth. 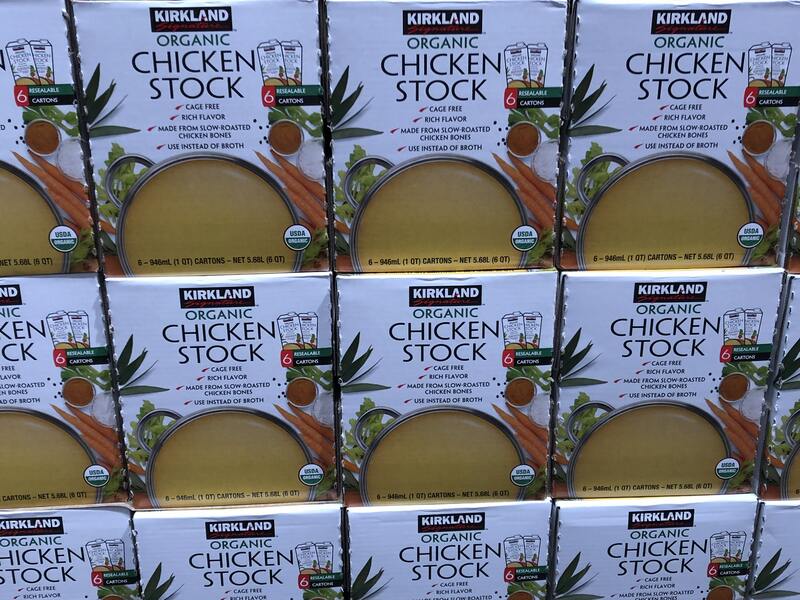 I use chicken broth in so many recipes like Chicken Pot Pie, Broccoli & Cheese Soup, and Jalapeno Popper Soup. I always keep several on hand. 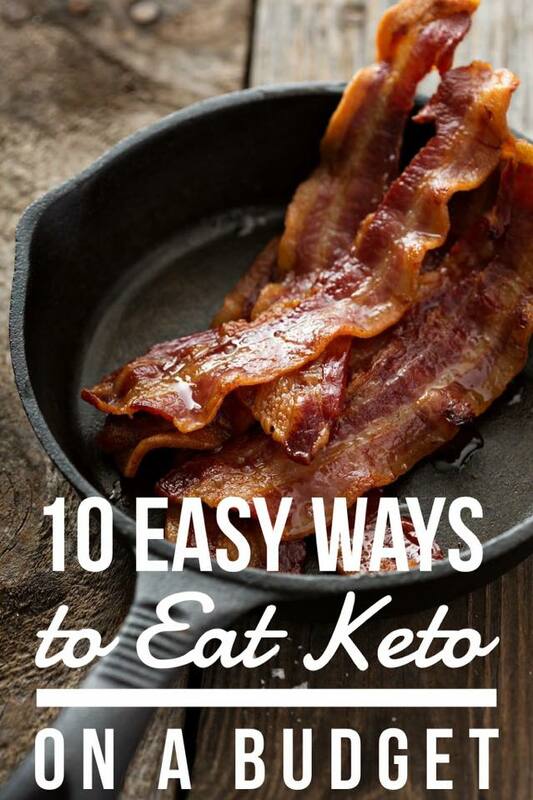 I think Rao’s might be a little famous in the keto/low carb world. This jar is huge! I also noticed this brand that came in a 3-pack. The net carbs are 5, which I believe is just one more than the Rao’s. 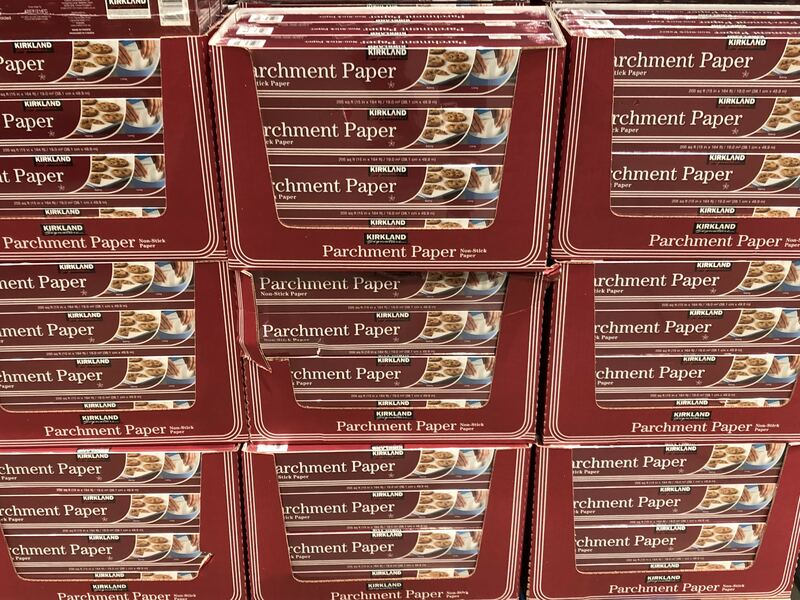 One of my favorite kitchen staples that I always stock is parchment paper. It makes it so easy to bake bacon in the oven and clean up is minimal. 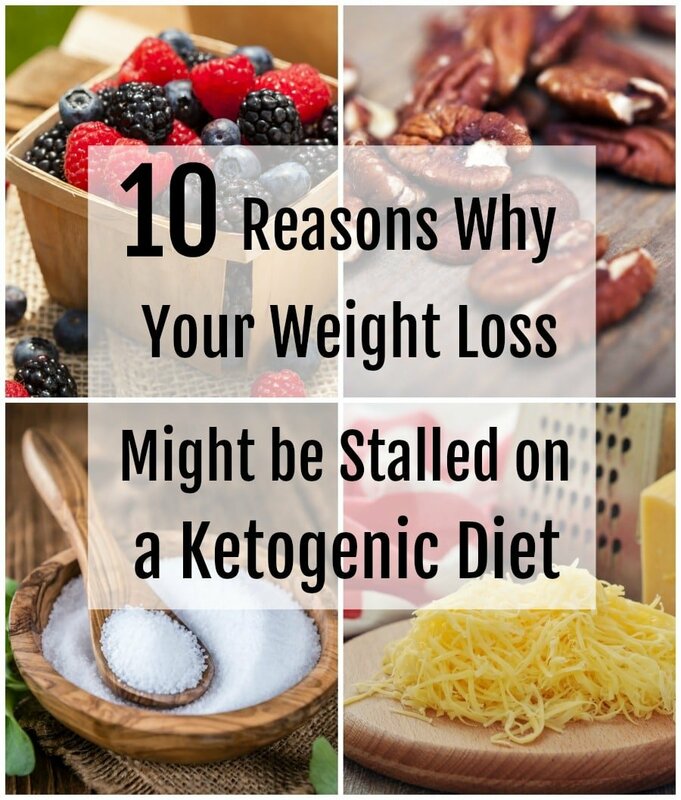 If you think you might be dealing with a weight loss stall, check out these 10 reasons that may be causing a stall. 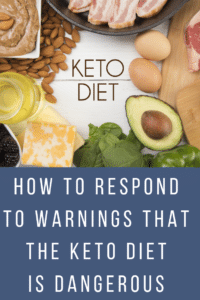 Here is an Amazon Keto List for many items you won’t find in your local grocery store and fun snacks. 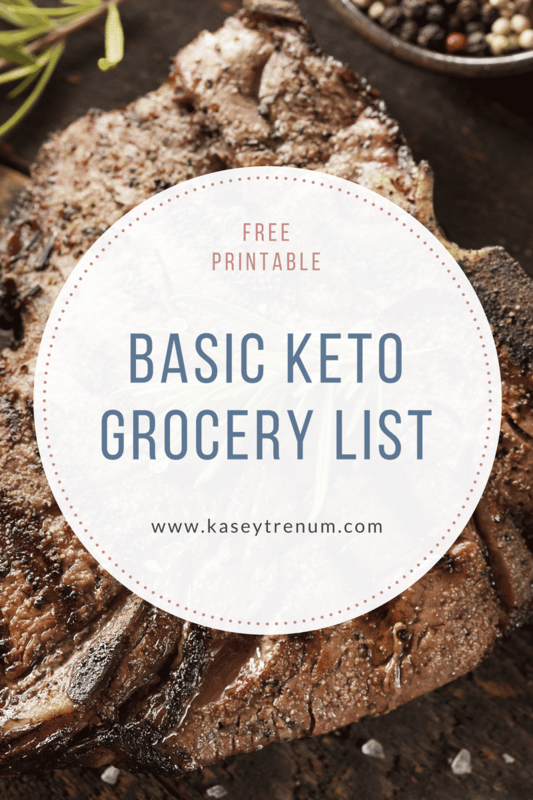 Don’t miss this free printable of the Very Best Basic Keto/Low Carb Grocery List. Looking for ways to save money? 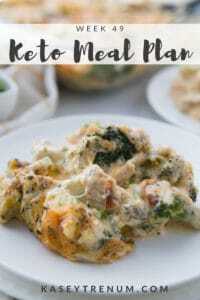 Check out these 10 easy tips for eating Keto on a budget. 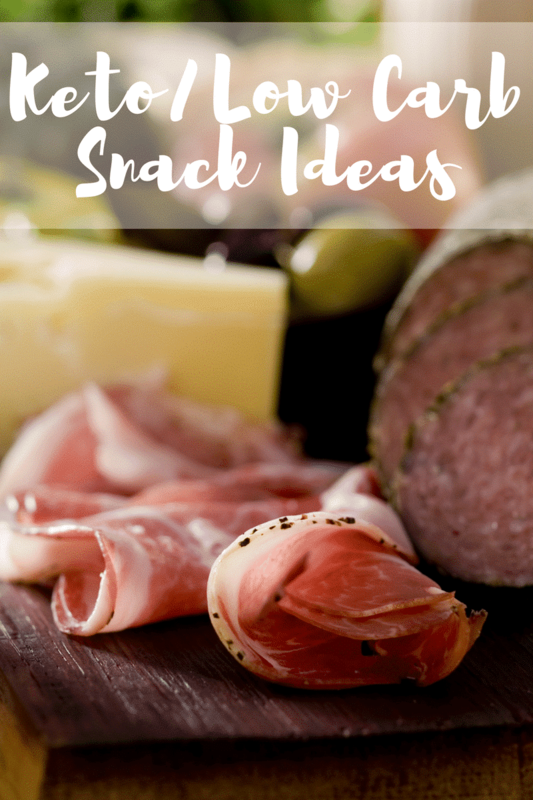 Don’t miss these keto/low carb snacks to help you stay on track. I never noticed the heavy whipping cream. 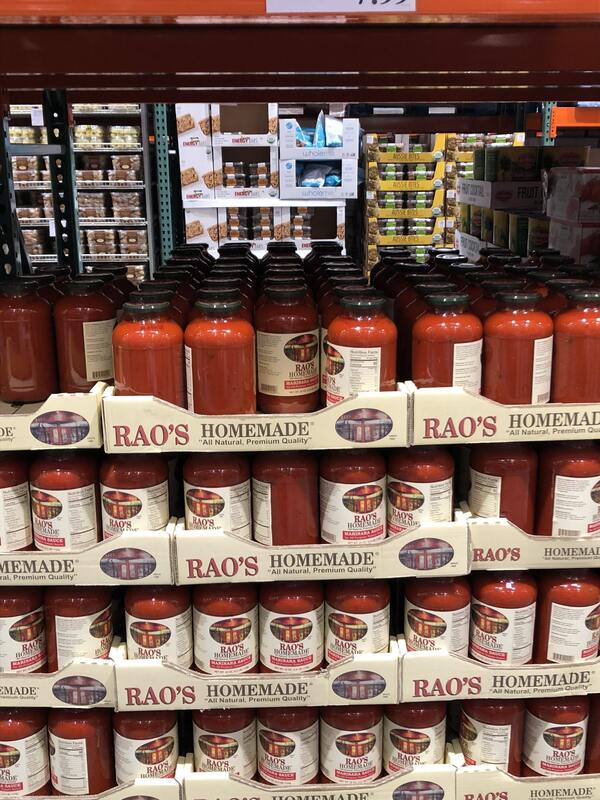 I’ve never heard of Rao’s, so definitely picking that up to try next visit. We’re debating whether or not to buy a shrink wrap system. 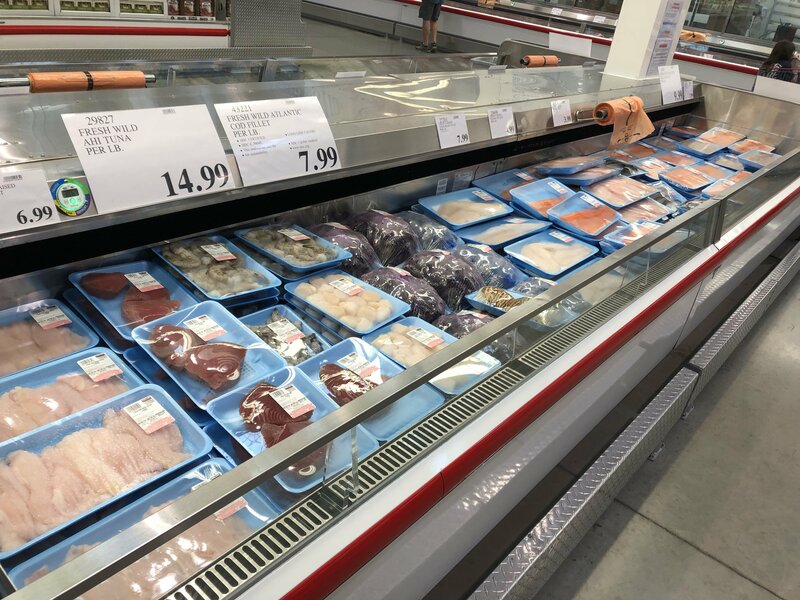 Are you freezing any of this? I can’t wait to try the 90 Second Strawberry Shortcake! What kind of saver system do you use? 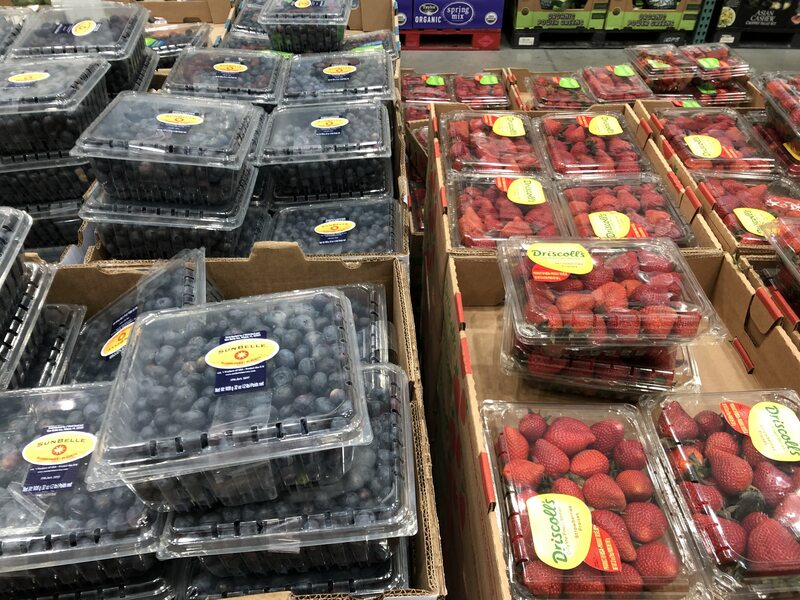 wow – I have not seen a lot of this at any of our Costco’s in Northern California, even the commercial Costco.